Preserving Farms for Farmers: A Manual for Those Working to Keep Farms Affordable, presents projects that permanently protected the affordability of whole farms, including land, farmhouse, barns, and other infrastructure, and ensured their continued use for food production. It also provides model legal documents, a model agricultural easement with option to purchase and a model agricultural ground lease, with commentaries. 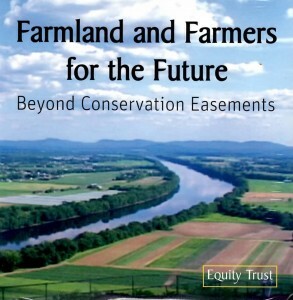 Equity Trust’s video, Farmland and Farmers for the Future: Beyond Conservation Easements, addresses the limits of conservation easements as a tool for preserving farms and it offers approaches for going beyond traditional conservation easements to meet new challenges posed by the emerging market for rural estates.